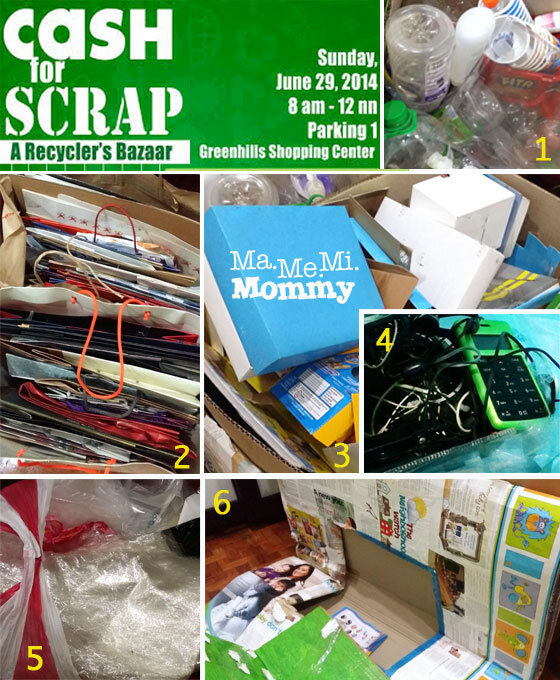 While doing some shopping in Greenhills, I’ve noticed a number of green posters and tarpaulin banners all around. Cash for Scrap, it says. Cash for Scrap? As in they’ll pay me for my trash?? After reading the details, I quickly hurried home. Shopping can wait, I have some trash collecting to do! 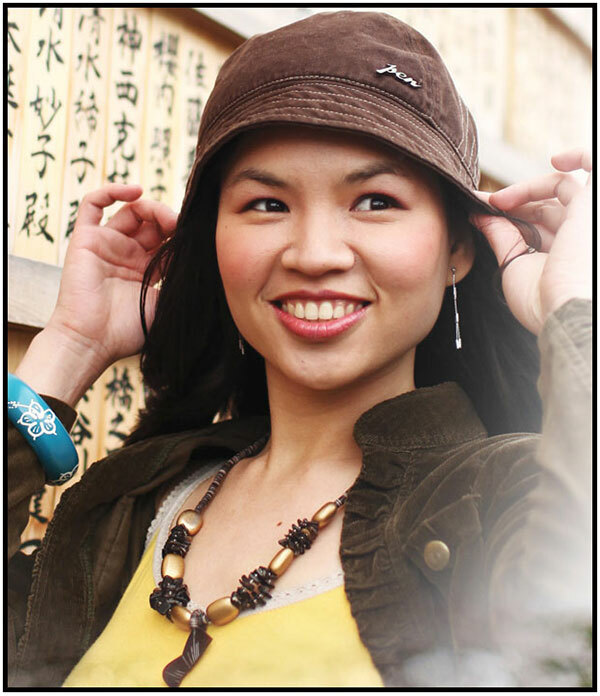 Plastic Bottles – drinking bottles, shampoo bottles, yogurt cups, I don’t know how I’ve managed to keep all of those! Paper Bags – There are just soooo many! I still have a hard time parting with the nice ones. Plastic Bags – Again, there are just soooo many! The DIY Playhouse I made for the kids – Awwww! I’ll surely miss you! 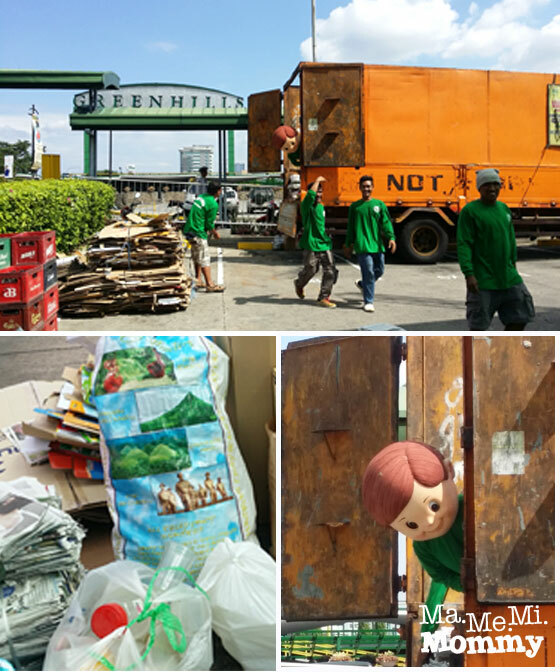 We woke up early on Sunday morning to bring everything to Parking 1A of Greenhills (across G-Strip). Since it was still early, there wasn’t much of a line yet. We unloaded the boxes of scrap and registered our names. All sorts of recyclables were everywhere, heaps of cardboard boxes, stacks of newspapers, boxes of plastic bottles, sacks of plastic bags, carts of electronic devices. Inside the parking lot was a big orange garbage truck ready to accept all the materials once they have been weighed in. To add some humor to the whole thing, much to the delight of my toddler, there was a mascot constantly peeking out of the garbage truck seemingly delighted to see all the recyclables the people were bringing in. When it was our turn with the scale, the men in green weighed in our scrap. They weighed it according to category as there is a different price per category. The woman in the booth then computed everything and handed out the money. So how much did I make? Before that, this is how they computed it, based on the handwritten “receipt” they gave me. Apart from the booths that accept the recyclables, there was also a stage where recycling talks and reusing demonstrations were being held. As with the lower right photo, the woman is demonstrating how to make something useful out of old magazine pages. 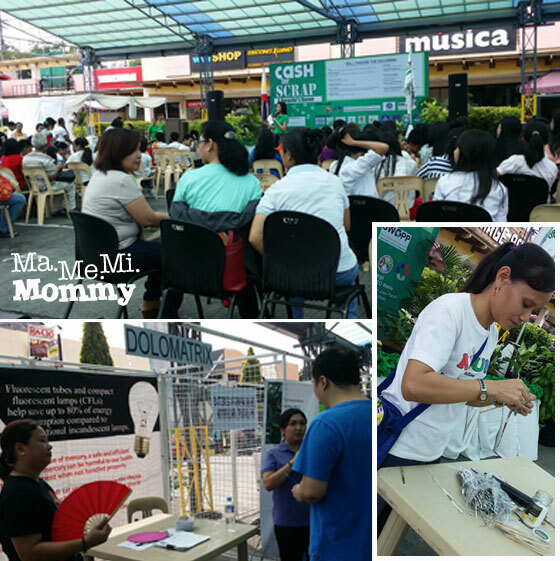 The lower left photo shows the booth of one of the participants, DoloMatrix, that accepts old and broken bulbs and CFLs for a fee. They don’t pay you for your CFL trash but you have to pay them to dispose these properly. For normal household consumers like us, it might make more sense to just throw them away than have to pay a fee for its disposal. For big companies that have to comply with standards however, it is a must for them to call such a company to properly dispose of these items. The other booths showcased finished products of export quality borne out of recycling and reusing the scrap we have at home. Clockwise from top: Bags , home decor, jewelries from plastic packs and bottles. A colorful mask made from styrofoam beads. A very trendy and colorful export quality bag made from plastic sando bags. With these wonderful creations, I hope we can all think twice before we throw that trash away. Put it in the proper segregation bin, recycle it, reuse it, upcycle it. Speaking of recycling, it would have been nice if we could actually see the process in action. Good thing there was this mobile recycling plant on the site. The technician feeds in styrofoam into the machine (lower left) and from it will come a big block of sort of plastic material (lower middle). From this renewed block, they can mold it into another product like the ruler my son is holding in the lower right photo. 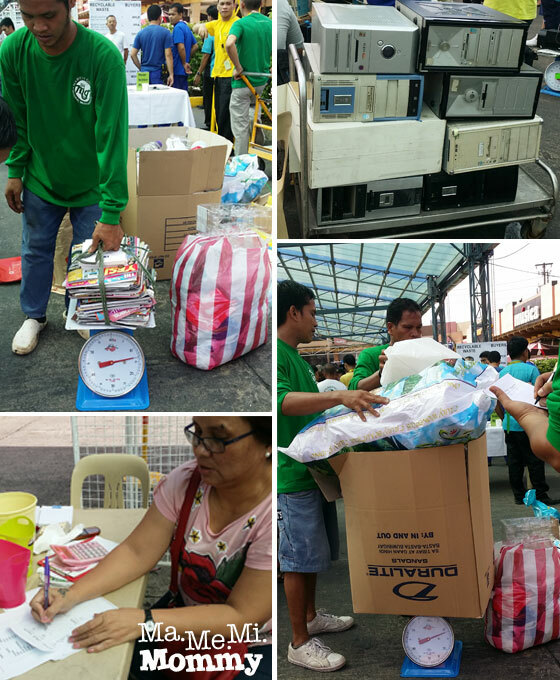 This is our first time to join this recycling event and it was a fun and rewarding experience. Not only did we get to take home some shopping money (you’re still wondering how much I made), we also get to heave a contented sigh knowing that we have helped Mother Earth in our own small way. I hope that the organizers and co-presenters of this event, National Solid Waste Management Commission under the Department of Environmental and Natural Resources, Barangays Greenhills and Wack-Wack, Solid Waste Management Association of the Philippines, and Ortigas & Company will continue to hold such an event even for the years to come.